Services: Ideas Consultancy & Full Design, Planting Design, Build Project Management,Plant Sourcing and Planting Up. 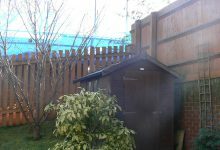 The customer had purchased the property as a result of a change of employment and did not like the garden for several reasons. There were many areas that needed to be addressed in the design. including solving the problems of a sloping garden, managing the planting for the heavily shaded areas caused by the neighbours retaining garden wall, creating greater privacy from the new housing estate being built at the bottom of the garden and to minimise the visual impact of the Liquid Petroleum Gas tank cover located in the middle of the lawn. The design for the garden also needed to include a small lawn, provide year round structure and colour, use a pastel colour palette and incorporate curved lines to create an informal look and feel. As the client budget did not allow for extensive hard landscaping, such as terracing to solve the sloping garden problem, a more imaginative approach was needed. Mounds of imported soil, retained by using additional block work, were used to create raised areas for planting. The ideas was that which once the plants had matured they would create the impression that the garden was much flatter than it really was. The planting included evergreen flowering shrubs suitable for the garden size, evergreen climbers and wall trained shrubs to help disguise the neighbour’s retaining wall, colourful evergreen and flowering perennials and seasonal bulbs to fill the gaps in the early years of the garden development. ..Just to say thanks for creating such a lovely garden for us. It has transformed our property and providing us with a place for enjoyment and relaxation. The planting has been really well thought through with wonderful results….